On P!NK’s The Truth About Love Tour, P!nk traveled the world with over 103 shows in 13 countries to bring the sold-out show and amazing spectacle of to hundreds of thousands of devotees. 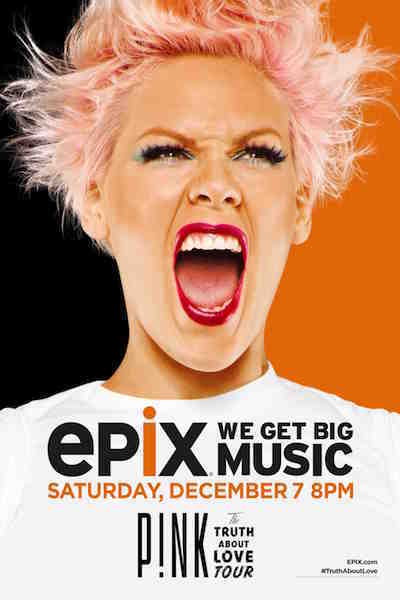 The 1 hour and 50 minute EPIX concert special was filmed during the Australian leg of the tour. Pulling from her seven album repertoire, the show includes some of her biggest hits such as “Blow Me (One Last Kiss),” “F***in’ Perfect,” “Try,” “Raise Your Glass,” and “So What” and P!nk’s recent single, “Just Give Me A Reason” featuring Nate Ruess which reached #1 on both the Hot 100 Chart for 3 consecutive weeks and the Hot AC Chart for 9 consecutive weeks. The critically-acclaimed The Truth About Love Tour is hallmarked by captivating theatrics and emotionally fueled performances that have secured P!nk’s place in history as one of the most spectacular performers working today. P!nk collaborated with creative partner and show director Baz Halpin to produce a visually stunning stage production full of performance elements that are uniquely P!nk. In The Truth About Love Tour, P!nk sonically soars through pyrotechnic fueled vocals to tender vocal moments with action-packed surprises from start to finish. P!nk’s seventh album, The Truth About Love debuted at #1 on the Billboard Top 200 as well as in six other countries. The album marks P!nk’s first #1 debut in the U.S. and a personal first week sales best. The album is certified platinum in the U.S. and was nominated for a 2013 Grammy for Best Pop Vocal Album. The Truth About Love produced the smash singles “Blow Me (One Last Kiss)”, “Try” and “Just Give Me A Reason” ft. Nate Ruess which marks P!nk’s 12th, 13th and 14th Top 10 hit on the Billboard Hot 100. Since her debut in 2000, P!nk has released seven albums (Can’t Take Me Home, M!ssundaztood, Try This, I’m Not Dead, Funhouse, Greatest Hits So Far!! !, and The Truth About Love), sold over 40 million albums, 65 million singles (nearly 20 million digital tracks), over 1 million DVDs worldwide and has had 14 singles in the top 10 on the Billboard Hot 100 Chart (four at #1). She is the recipient of three Grammy® Awards, two Billboard Music Awards, six MTV Video Music Awards, two MTV Europe Awards, and two People’s Choice Awards.